During the 2014 holiday season, Stella Artois was inspiring consumers to give beautifully meaningful gifts to those they love. We wanted to do the same for our fans. And because pairing delicious, refined foods with Stella Artois is always a brand priority, we partnered with high-quality condiment purveyor The Hatchery to give our fans something they could enjoy along with their favorite beer. 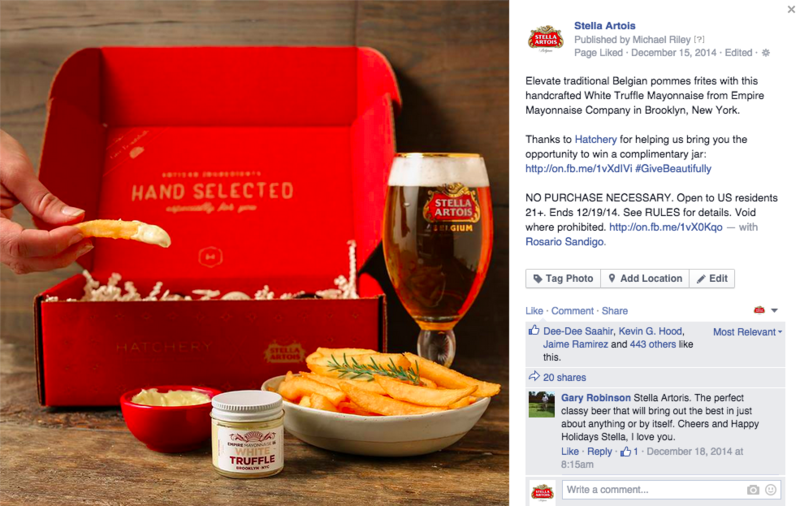 We gave away the condiments and a Stella Artois chalice in a beautiful box through a Facebook Sweepstakes that asked fans to tell the brand who they would like to give the Hatchery Box to and why. The content was almost as beautiful as the stories it provoked fans to share with us.